Please be advised that a special announcement regarding the March 2 game will be made tomorrow, January 17. We will send you full details tomorrow, as they are released. Last edited by Iggy_12; 01-16-2019 at 01:22 PM. Odd team if so, but maybe Iggy's schedule more than anything determines that. Retire Iginla's jersey at a Wild game? Lame. Against the wild is lame, but makes sense given it's hockey night in Canada. Iggy always wrecked the Wild. Maybe that’s the connection. Wild are a tough draw, this might be to get more butts in the seats but yeah, poor choice on the surface if thats what this is. And he scored his 500th against them. The vehicles will be removed form the concourse. Last edited by joejoe3; 01-16-2019 at 10:24 AM. Wild is lame, but Iggy always seemed to dominate them, so there is that. I wonder what his stats are against the Wild compared to other teams. EDIT: I see people already made this point while I was typing it out. Last edited by Har-Calgary; 01-16-2019 at 10:25 AM. Game played at Springbank outdoor rink? NHL has found conclusive proof that the puck was in. 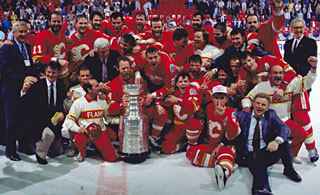 2004 Stanley cup retroactively awarded to the Calgary Flames. Last edited by sureLoss; 01-16-2019 at 10:56 AM. It would be for Iginla, his family, The Calgary Flames organization and their own fans - the opposing team should matter little. Ceremony in a game against a team that doesn't sell well (unlike Pittsburgh and Boston) probably makes sense for the Flames. I also agree with Jiggy that the opposing team shouldn't matter much to Iginla. Didn't he score his 500th goal against the Wild? ?